Happy Picture Polish Thursday! This post is coming to you earlier today because I’m home for another day. For all of you who aren’t in the US or live in a cabin in the woods with no connections to the outside world, then you know that the US Government has “Shut Down.” Since Congress can’t decide on a budget, millions of government workers aren’t allowed to go to work. I happen to be one of those people. I’m not going to get in to any details about the shut down, but it has given me some extra time to focus on school and to focus on my blog! So now onto the polish! 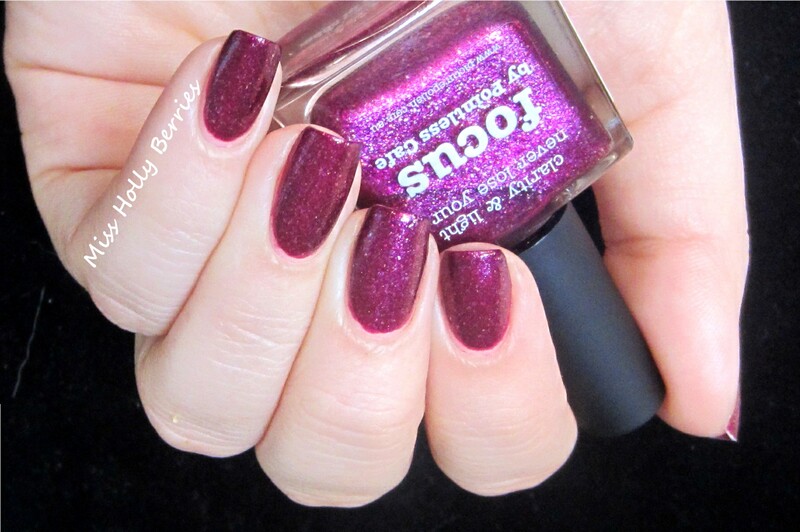 Picture Polish “Focus” is a dark magenta glass fleck. This polish seriously shines on your nails. In some lights, it looks like a vampy deep dark magenta, so dark that it almost looks like a wine color. But when it hits the light you get this strong flash of magenta! And the flakes that are in this polish, it makes the finish look more complex than your average dark pink! The formula on this polish is like every other Picture Polish I’ve tried … aka close to perfect. It took 2 coats to be completely opaque. The brush makes application a breeze and I barely ever need to do any type of clean up. It dried really quickly and has been chip free and tip wear free for the last 3 days! That’s impressive! What do you guys think? What are your favorite dark pink polishes? ← My Skin Care Routine! Holly, you look great in pink! 🙂 Your photos look great !